There are lots of despicable people in Washington engaged in a lot of unsavory behavior, so it would be very difficult to get agreement if you asked regular people to select the most odious feature of the political class. 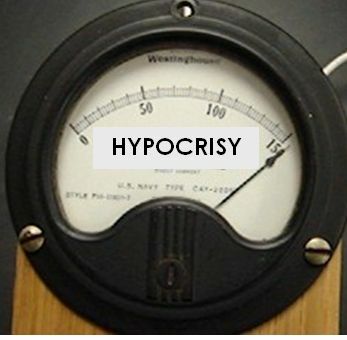 Many people would probably choose corruption as the defining characteristic of Washington, and it would be hard to argue with that choice, but I think hypocrisy is an even better choice. There’s something fundamentally wrong when people push for policies while making sure they don’t have to abide by the results. Yet it happens all the time in government. 1. It galls me that the pro-tax bureaucrats at the OECD get tax-free salaries while pushing for higher taxes on everyone else. 8. To close this list on a humorous note, we also have Occupy Wall Street protesters who fight “The Man” while wanting to make “The Man” more powerful. But if you want a really powerful example of hypocrisy, nothing stands out more than politicians trying to exempt themselves from Obamacare. They’ve even been complaining that the law is so bad that they may quit their jobs. And they’re so disconnected from reality that they think we’ll be upset at the loss of their “seniority” and “experience” – as if taxpayers value their ability to squander money. But it’s not just politicians who are being hypocritical. The bureaucrats at the IRS also don’t want to live under Obamacare – even though they’re the ones who will be forcing us to live under that misguided law! Here are some excerpts from a report in the Washington Examiner. IRS employees have a prominent role in Obamacare, but their union wants no part of the law. National Treasury Employees Union officials are urging members to write their congressional representatives in opposition to receiving coverage through President Obama’s health care law. …Like most other federal workers, IRS employees currently get their health insurance through the Federal Employees Health Benefits Program, which also covers members of Congress. House Ways and Means Committee Chairman Dave Camp offered the bill in response to reports of congressional negotiations that would exempt lawmakers and their staff from Obamacare. …Camp spokeswoman Allie Walker said. “If the Obamacare exchanges are good enough for the hardworking Americans and small businesses the law claims to help, then they should be good enough for the president, vice president, Congress and federal employees,” she also said. To augment the remarks of Rep. Camp’s spokeswoman, it also would be good to somehow figure out a way to make the lobbyists and other Washington insiders participate in the Obamacare exchanges. There aren’t many “sure things” in life, but one of them is that Obamacare would be repealed almost instantaneously if the bigwigs in Washington actually had to live under the law designed for peasants like you and me. Unfortunately, that’s why Congressman Camp’s legislation will never get approved. So let’s end this post with a bit of dark humor from Bob Gorrell. 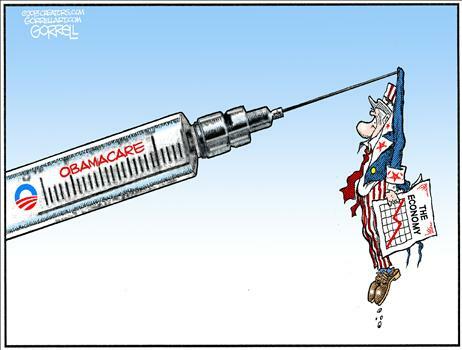 You can enjoy more Obamacare cartoons by clicking here, here, here, here, here, and here. P.S. For readers in New Jersey (and also New York City), I’ll be speaking this upcoming Wednesday, July 31, at the Friedman Day luncheon sponsored by Americans for Prosperity. The fine art of social just-us. As usual socialism is for the people, not the socialists.